Check out our other clock style galleries by hovering over Galleries and then Barrel Head Clocks in the main menu above. 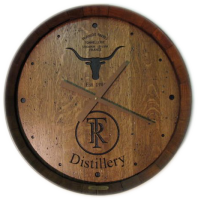 Our whiskey & spirits barrel clocks are the finest and most unique available anywhere. Not only stunningly beautiful but highly functional, they are the perfect piece of decor for your whiskey or liquor label or hobby, whether you incorporate your own logo or one of our existing designs. Perfect as decorative signage or branded merchandise. They also make an incredible gift for any whiskey or spirits lover. Each beautifully carved and finished piece is made to your specifications. Use this contact form to tell us the gallery name, image #, any changes you would like to see and your ship-to zip code. We will email you a free design proof and price quote. We can iterate on the design until you are ready to place an order, at which time we can email you an invoice. 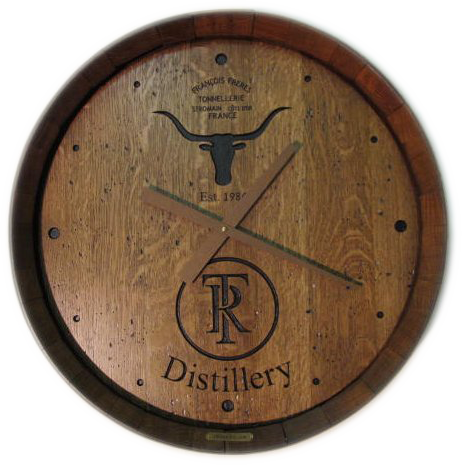 See Pricing for Barrel Carvings and Clocks for price overview. Click any image below for a more detailed view, description and testimonial.